Have you ever asked yourself the question “Does my dog love me?” Dogs do feel emotions and love but not quite in the same way as humans. In order to embrace how dogs love their humans, we must understand how their minds work. Their way of thinking, so to speak. A dog’s love for his owner is still love. It is just a simpler, more straightforward type of love that should be appreciated for what it is. Dogs do have emotions, but they don't experience the depths of emotions that we do. The fact that dogs experience pleasure and happiness when their owner is around, or what we humans interpret as “my dog loves me,” has actually been scientifically proven. Professor Gregory Berns at Emory University did M.R.I.’s on dogs to study these emotions. He discovered that a canine's caudate nucleus, the part of the brain that experiences pleasure, becomes more active in the presence of his owner. However, it also became more active when the dog thought he was going to get some dog food. There is still no concrete proof that dogs are capable of loving their humans in the same way that humans love other humans. This is only proof that they feel pleasure and happy emotions when their owners are around. Dogs are pack animals. Their pack mentality dates all the way back to when their oldest ancestors roamed the world. It is most evident in the behavior of wolves. In the world of wolves and dogs, there must be a hierarchy. There must be a “ruler” or dominant leader of the group. When there is no dominant leader, someone else in the pack must step up and establish dominance. That is just how it is. There are no other possible options. Wolves and dogs living in actual dog packs sometimes appear to love each other and their leader, but it is not the same sort of love that people feel for one another. The dominant leader protects the pack, leads the hunt and provides food for the young. It’s a tough job but, in a wolf’s world, someone has to do it. In the world of the domesticated dog, his owner is his pack leader. He loves and respects his pack leader. Dogs don't naturally come to think of their owner as the alpha, but with proper training this understanding can be formed. Does my dog love me? There's only one way to find out – you need to observe your pet and his behavior around you. One of the ways dogs show love to their owners is by being submissive to them. In a nutshell, a dog will do what he is told to do because this makes the pack leader happy. He is answering the “does my dog love me” question with a resounding “yes,” in his own doggy way. The dog goes outside to potty because this makes his human happy which, by extension, maintains order within the pack. A dog’s obedience to his owner is a product of his training. He learned that his owner is pleased with him when he behaves and follows commands. In order to fulfill his place within the pack hierarchy he needs please the alpha – that's you! Dogs demonstrate their emotions with their expressions, too. A happy dog will have a relaxed facial expression when he looks at his human. His ears will be down and his facial muscles often constrict in a way that makes his eyes seem to twinkle. If he is really happy and a little excited he will wag his tail or even his whole body. With this body language he is saying “yes, I love you.” There are even some dogs that can vocalize in a way that sounds like they are saying “I love you” to their owner. Of course, these dogs have no idea what they are actually saying. Dogs that make sounds that seem like words are only mimicking their owners because it pleases them. It's still pretty cute, though! There are misconceptions when it comes to doggy love. When a dog wants to be held, cuddled and petted, their humans will often think it is because their dog loves them and wants to be loved back. This, again, is not true in the same sense that humans who love each other display these behaviors to show affection and love. Cuddling and petting for a dog is more of a reassurance that the pack leader or owner is still accepting him as a member of the pack. Such attention from strangers often has the same effect but not always. Some dogs do not need or want such reassurance from people who are not members of the pack. While a dog will wag his tail when he is happy, a wagging tail does not always mean the dog is happy. He may not be saying “I love you.” A dog’s overall presentation needs to be evaluated to accurately understand a tail wag. A dog that is feeling threatened or aggressive will hold his tail up and wag it stiffly back and forth. This same dog may be standing as tall as he can with his ears up and his face drawn slightly forward as if he is trying to pucker up. He may even be growling quietly. 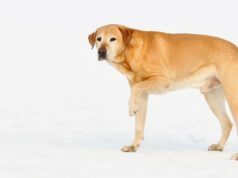 When a dog is holding his tail down and slightly tucked between his hind legs but wagging it at the same time, he is displaying submissive or nervous behavior. His head will likely be lowered slightly with ears down and gaze averted. While this behavior is probably submissive, it does not necessarily mean “I love you.” He might just not want to fight. Dogs often want to sleep with their humans, but this is not because they love them in the way that couples who love each other want to sleep in the same bed. Freeze-baby dogs want to sleep with their humans to stay warm. Dogs commonly just like to feel close to their pack leader or other pack members. Dogs who have a naturally dominant disposition may want to sleep with their master as a way of asserting their dominance or challenging their master’s dominant position in the pack. These dominant-type dogs should never be allowed to sleep on the bed with their human. Making them sleep on the floor in a lower position will help maintain the pack hierarchy which, believe it or not, will make the dominant dog happier. This type of dog often feels like he has to fill the dominant position because, well, somebody has to. People often arrive at this conclusion because humans tend to protect their loved ones. Dogs, on the other hand, protect their pack members. Each pack member serves a purpose within the pack. They protect each other in an effort to maintain the status quo, so to speak. Rescue dogs rescue people because they are trained to do so. They learn that rescuing people pleases their master or dominant pack leader. Dogs seem to display the emotion humans interpret as empathy for an unhappy owner. When a dog’s human is sad or not feeling well, the dog will often appear to feel sorry for them and try to show love and affection. The dog will want to snuggle or lay his head on the lap of his unhappy human. This behavior seems sweet and kind, as though the dog loves you and feels sorry that you are ailing or unhappy, but it is mostly learned behavior. People who are sad, upset or ill feel better when they pet or cuddle their dog. There is an actual physiological response in humans when they pet dogs. This is why there are service dogs that visit hospitals to cheer up the patients. Dogs enjoy the contact with their humans, their humans enjoy the contact with their dogs and naturally reward the behavior by talking softly and petting or hugging the dog.